NASA administrator Charles Bolden did not break any laws but did breach an ethics pledge by consulting with one of his former employers on NASA business, an investigation by the space agency has concluded. NASA's Office of the Inspector General, the agency'sinternal watchdog office, released an 11-page report of the findings today(Sept. 20). "I have reviewed the report and I readily accept thefindings of NASA?s Inspector General," Boldensaid in a statement sent to SPACE.com. The investigation was sparked by an April 30 phone call Boldenmade to a senior official at Marathon Oil Corp.
Before becoming NASAadministrator in July 2009, Bolden served on Marathon's board of directorsfor six years. At the time of the phone call, he held more than $500,000 instock in Marathon, according to the report. Bolden placed the call, which lasted 10-15 minutes, seekingadvice about biofuels, because NASA was considering funding an alternative fuelproject to research producing fuel by processing wastewater and algae. "Bolden told us that he still was seeking informationabout the feasibility of deriving fuel from algae," the InspectorGeneral's report stated. "He said he recalled that Marathon might havesome expertise in this area and decided to contact the company to gatheradditional technical information and perspective concerning the use of algae asbiofuel." The investigation into a possible conflict of interest foundno evidence that either Bolden or the oil company received any financial gainas a result of the call, or that the conversation caused Bolden to reconsiderhis opinion on the proposed project. "I should have explored the implications of my inquiryprior to acting," Bolden said. "As soon as a possible conflict ofinterest was identified, I proactively contacted our General Counsel and fullysupported an independent review of my actions." Ultimately, NASA did decide to fund a two-year, $10 millioncollaboration with the U.S. Navy on projectOmega, short for Offshore Membrane Enclosure for Growing Algae. 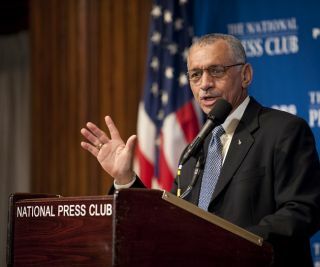 While the probe found that Bolden did not violate any ethicsregulations or federal laws, in reaching out to Marathon Bolden broke a pledgehe had signed on becoming NASA administrator that he would refrain for twoyears from having private communications with Marathon or any other of hisformer employers concerning NASAbusiness. In an interview with the office of Inspector General, "Boldenreadily acknowledged that he had erred in contacting Marathon," the reportstated. The administrator has since recused himself from the Omega project and takena refresher course in ethics training. "Although the Inspector General found that no laws werebroken, this incident serves as a reminder that we must all strive to holdourselves to the highest standards of ethical conduct ? and I have aresponsibility to set that example for NASA and its senior leaders,"Bolden said. Bolden is a former NASA astronaut and space shuttlecommander with four spaceflights and 14 years in the astronaut office under hisbelt. He is a retired major general in the U.S. Marine Corps. In April 1990 he served as pilot on the shuttle flight that launchedthe HubbleSpace Telescope into orbit. Bolden also flew on the first joint U.S.-Russianshuttle mission, which featured a cosmonaut as a member of his crew.